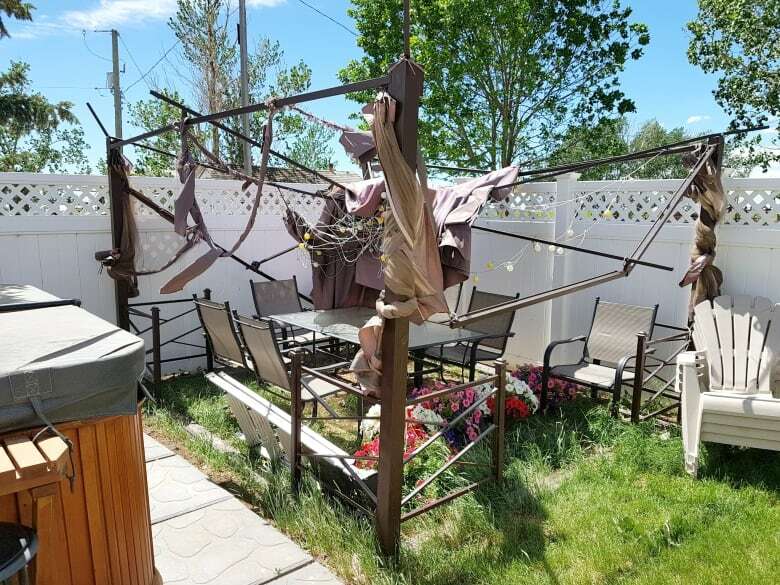 Eastern Alberta saw the highest wind speeds when a series of storms swept across the province on the weekend, with gusts reaching 122 kilometres an hour in Lloydminster and 117 km/h in Medicine Hat. Eastern Alberta saw the highest wind speeds when a series of storms swept across the province on Saturday, with gusts reaching 122 kilometres an hour in Lloydminster and 117 km/h in Medicine Hat, according to Environment Canada. 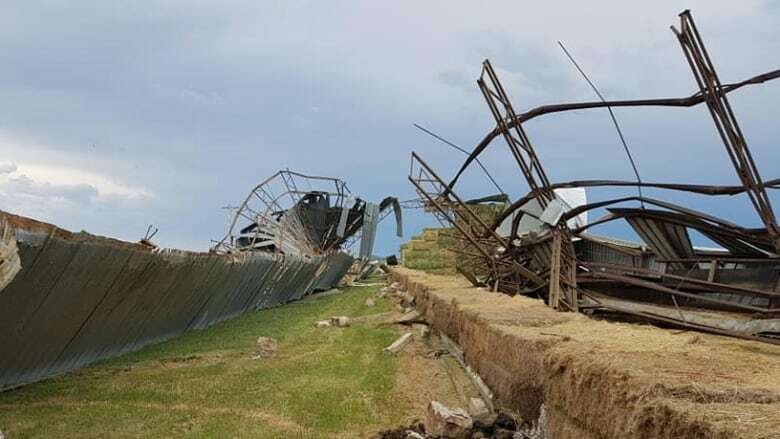 Semi-trailers were blown over on some stretches of highway and in Tilley — a hamlet about 200 kilometres southeast of Calgary — powerful winds left a swath of damage to area farms and rural properties, including an empty hay shed being destroyed and a number of pivots — the large sprinklers seen in fields — were knocked over. "There were a number of grain bins that were picked up and tossed and they were just rolling like tin cans in a wind," said Tilley fire Chief Patrick Fabian. "Some of them were rolling in excess of half a mile before they crashed into a tree or some buildings and then just your regular run-of-the-mill damage from high winds. "Whatever had hit us was very intense and very destructive and very quick." A trough of low pressure was to blame for the bad weather, said Environment Canada meteorologist Heather Pimiskern, which is expected to stick around. "The cold low is expected to trundle around the province for the next couple of days, so we will see showers on and off throughout the province and accumulating rain amounts toward the north and central regions, then we should clear out later in the week." The Fort McMurray area could see up to 50 millimetres of rain between Sunday and Wednesday and other parts of northern Alberta could see between 20 and 40 mm. "With these cold lows, then tend to not move off very quickly so you tend to have rain that perpetually hits a certain area," said Pimiskern. "It's not abnormal for us to have a cold low in June and it's not abnormal to see rainfall amounts in excess of 20-plus millimetres." 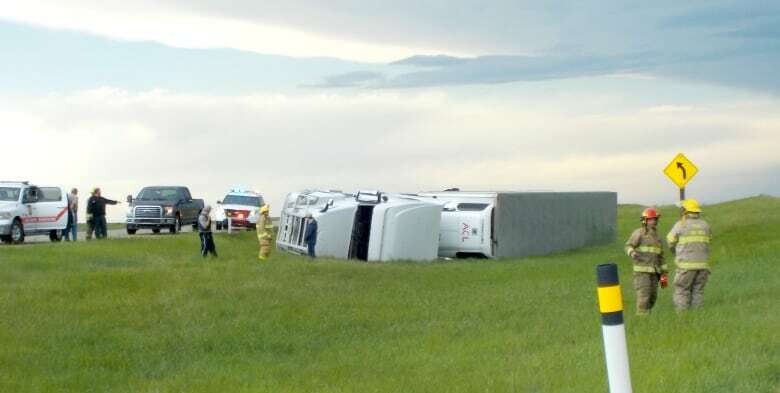 There were also reports a tornado touched down near St. Paul — about 200 kilometres northeast of Edmonton — on Saturday, however Pimiskern says they haven't been able to confirm that. "We did receive a number of reports of funnel clouds in that area and we did have a tornado warning out as the conditions in the atmosphere were conducive for the potential for the development of a tornado … but at this point in time we do not have anything to confirm a tornado did occur. Normally by this point in time we would have either pictures or video or someone calling in telling us what they saw." A number of storm chasers were in the area watching that particular storm develop, said Pimiskern, and none reported seeing a funnel cloud touch the ground, which has to happen for it to be categorized as a tornado. Fabian added his own home in the Tilley area wasn't immune to the wind storm. "My upstairs window was completely blown out," he said. "It was a double-paned sealed window, and the intensity of that was so high that it actually blew shards of glass right across the house. There's pieces of glass all over."